Back row: Dorothy Cowdell, Jean Turner, Joan Griffiths, Pauline Sorrell, Hilda Woodhouse, Dorothy Davies. 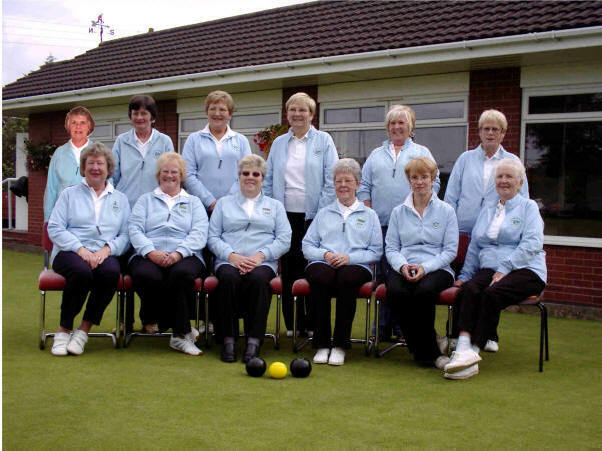 Front row: Jean Wilson, Maggie Whitehouse, Christine Lloyd (captain), Joyce Blakemore, Pam Lacy, Betty Rose. the HORTON SHIELD. Tony Wilson (right) was the runner up. changing constantly, but Mike prevailed in the end to win 21-19. After the annual bowling match competing for the ALLAN POWEL TROPHY. against CLEOBURY MORTIMER BOWLING CLUB. This years match was held at Cleobury Mortimer. The winners of the annual bowling match against Guilt Edge Bowling Club. Cleobury Mortimer, 179 shots; Guilt Edge, 140 shots. From the left, Pete Arrowsmith runner-up; Chris Cowdell and Mike Arrowsmith, the winners, and Tony Wilson, runner up . fought back to lead 20-19 with the final end going to Chris and Mike to win 21-20. The singles competition is run on a handicap system. Chris was of scratch and Betty was of +4. with Ken Reynolds (right) the runner up. Mike won 21-20.
who is one of the clubs events organisers. Mike Arrowsmith and Jean Wilson (left) being presented with the Ison Cup (scratch doubles) by Brian Sheldon (Club Captain, centre). Maggie Whitehouse and Tony Wilson (right) were the runners up. The score being 21-6 to Mike and Jean. The Captains Day finalists and runners up. Pauline Sorrell, (left front) runner up; Brenda Sheldon, (rear left) Club Captains wife. The 4 finalist are seen with their prizes. The losing semi finalist in the Captains Day Competition. (left to right) Ken Reynolds, Joyce Blakemore, Linda Goucher and Jeff Martin. Three shots of members taking part in the Captains Day competition. (centre) Mike Hutchison, (right) Ron Reed. Phil Pack, (left) and John Cadwallader. These two members are responsible for organizing the days matches. The event is run as a round robin with each game played over 7 ends and 4 games in pairs. Four, of the highest scoring pairs, go forward into the semi-finals, played over 9 ends and the Final is played over 11 ends. The day was a great success, marred only by a short shower late on in the afternoon. There was a superb buffet lunch provided and supervised by Brenda Sheldon, Ann Jones, and Hilda Woodhouse. both are in the UK on holiday from Australia. Louise's parents are Tony & Jean Wilson, who are members of the club.